Description: Jill once swore that she'd never make jewelry, but we're so glad she gave in and showed us this beautiful chainmaille necklace! I am self-taught and I follow my heart. It leads me to very interesting places. First, I learned how to make dream catchers. The next thing I began creating were fan pulls and other crafts I can add beads to. That lead to learning how to work with wire. I vowed I wouldn't make jewelry - so many people seem to be doing it. I wanted to be different. So, I have found myself making jewelry. I first made a couple necklaces using chain maille stitch. Well, my daughter's bracelet is here in the gallery. I have made another bracelet for a bridesmaid and a necklace for myself. The other bridesmaid wants earrings. I'm working on them. This place in the gallery has my necklace. I made the flourish to go with the dress I'm going to wear to my daughter's wedding. The chain is trizantine weave. I used 18 gauge half-hard nickel silver wire for the flourish and s-clasps. The jump rings are 18 gauge 7/8". 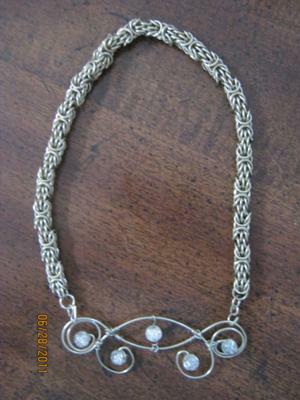 I learned how to make the chain maille by searching sites and looking for the easiest - free - instructions. Anyone interested, please let me know and we can exchange email addresses. I highly recommend starting with the easiest stitch, as it is called. If you are a beginning artist, you have a great future. This necklace is lovely. And yes, it would be good if you could do a video on how to make it. Or, if you're not into video, you could take really go photos of stages on fabricating the necklace. Hope you have a great time at the wedding! Beautifully done. I would love to make chain maile, but looking it up on the computer has given me grief. I just have to admit I'm a computer dummy. Can you tell me how to make it? or how to look it up please. I would love to make chainmaille! Yours gives me the 'wants' to make some! I have made a lot of O rings.